Color: Please Choose OneNatural/Kelly GreenNatural/TurquoiseNatural/PinkNatural/Citrus GreenTurquoise/PinkNatural/Navy-Out of StockNatural/Red-Out of Stock Personalization Type: Please Choose OneNoneMonogramSingle InitialName/Phrase Initial Monogram or Name: Font Type: Please Choose OneNoneDiamond (monogram)Circle Script (monogram)FishTail (monogram)Block8Block107Script10Script51EScript51A#15A Font#40 Font Thread Color: Please Choose OneNoneTurquoisePinkCitrus GreenBrownNaturalWhiteBlackOrange Who is this item for? These versatile Canvas Boat Bags are wonderful to tote around just about anything you might need! Durable Canvas with a zippered closure top and an outside pocket on one side, zipper closed cotton pocket on the inside. 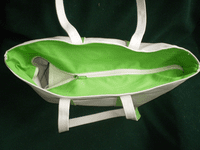 Extra long handles for easy over the shoulder carrying. 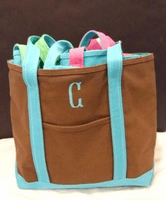 Personalize it with a monogram, single initial or name and for $5.00 extra add a design. Please us the empty personalization box for the initial(s) or name and complete the "who is it for" section. For more detailed information regarding how we embroider please see the Personalization Page.